When a conniving real estate developer named Willy Bank cheats Reuben out of a sizable investment, Danny Ocean and the rest of his crew take it upon themselves to get revenge on Willy by bankrupting his new casino on opening night with the help of an unlikely partner. If you think the past jobs of the Ocean's crew had a lot of moving parts, wait until you see all of the cogs in the wheel of this long con machine. 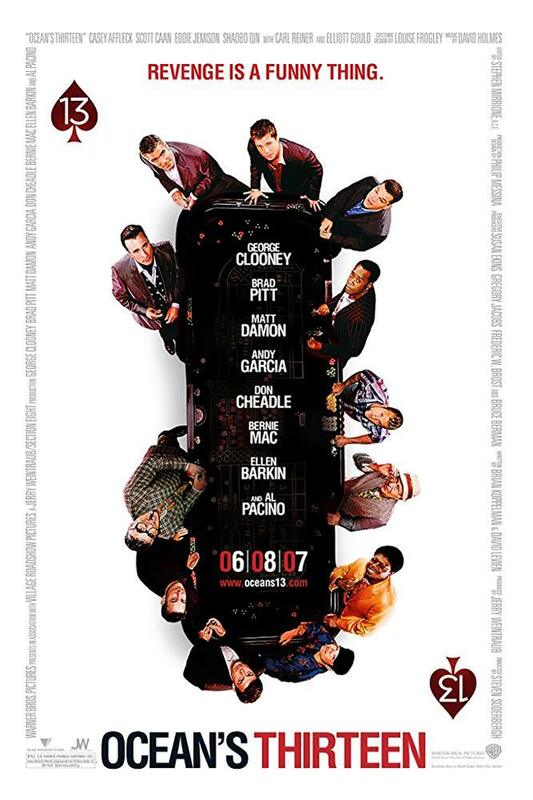 "Ocean's Thirteen" is the third film in the "Ocean's" franchise. It is once again directed by Steven Soderbergh, who besides directing the first two "Ocean's" movies has made films like "The Good German," "Haywire," and "Magic Mike." Taking over as writers for this installment are Brian Koppelman and David Levein, who really love running movies, having written "Runaway Jury" and "Runner Runner." All of the original cast members reprise their roles in "Thirteen" with except for Julia Roberts and Catherine Zeta-Jones because women and romantic interests only bog everything down, right? New to the cast is Al Pacino as Willy Bank, a real estate developer who strong arms his partner Reuben Tishkoff (Elliot Gould) out of his share of the new casino into which he invested almost all his money. Danny Ocean (George Clooney) and the rest of his team hatch a plan to get even with Willy by completely bankrupting his new casino on opening night. The investment in this long con is huge, so they seek help from a very unlikely and equally untrustworthy partner: their formal rival, Terry Benedict (Andy Garcia). As you may know, we enjoyed the first "Ocean's Eleven" film quite a bit. It's a zippy and fun heist movie with a great cast. It's follow-up, "Ocean's Twelve," took a bit of a dip for us since everything interesting about it happens off-screen. Luckily, the chemistry between characters was still fun enough to make it passable. 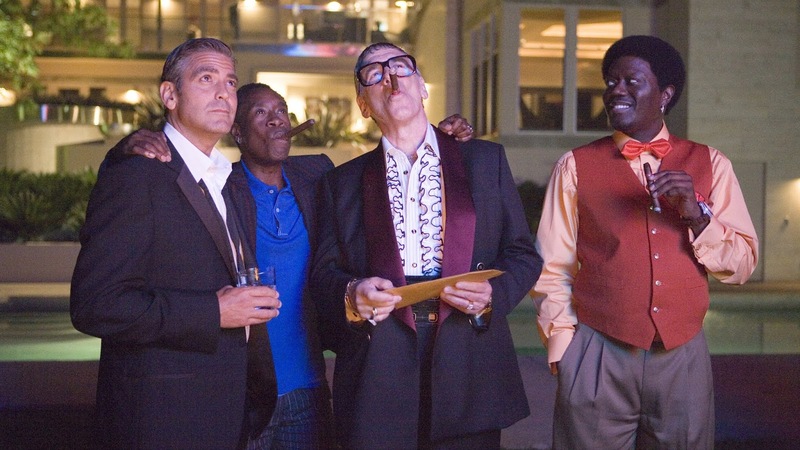 Will "Ocean's Thirteen" descend even further? The answer to that question is no! "Thirteen" manages to bounce back a bit and is a clear improvement on "Twelve," but it's not quite as good as "Eleven." Soderbergh learned from the mistakes he made during the second installment, and this time around, he keeps most of the "big job" on-screen. The heist we see is the heist that matters, and there is no secret second heist happening off-screen that will be conveniently revealed later in voiceover form. That being said, there are still plenty of convenient, contrived moments, as is par for the course with this trilogy. Still, George Clooney and co. have the same electric chemistry and all of the actors look like they are still having a good time even though this is the third movie in the series. 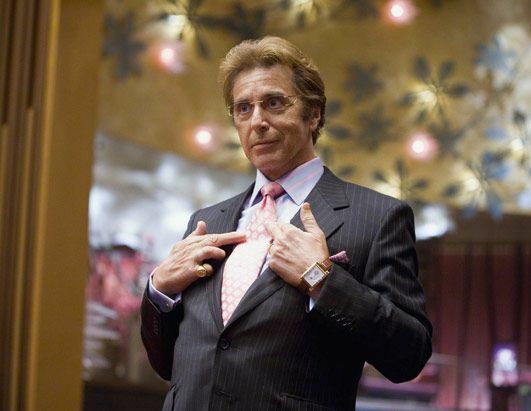 Al Pacino makes a great new villain for Danny Ocean and his team because he thinks he is untouchable. We get to see how the crew works to outsmart and out-scam the scam artist. Unlike the last installment, we get the feeling that each character has a purpose and each member of the team gets their moment to shine. We are engaged by the story and all of the inevitable twists and turns it takes. There is also a lot of humor in this installment, probably more than any of the previous entries into the franchise, which makes this one a real good time. This can be a double-edged sword because sometimes the excessive humor can push the envelope to be a bit too much and can be too cheesy at times. With a great new villain, interesting technological advancements and the same ol' charming crew, "Ocean's Thirteen" is an enjoyable return-to-form that's worth watching if you have liked any of the other installments in the franchise.